Honing compound is extremely fine abrasive used in the final polishing stages of sharpening. These abrasives are sometimes loose, but are usually held in a medium like a wax bar, a paste or a spray. The particles in our selection of compounds range from 6 microns, roughly equivalent to a 2500 grit water stone, down to .5 micron, or about 30000 grit. Various materials are used for the abrasive particles such as aluminum oxide, chromium oxide and diamonds. How do I use honing compound? Honing compound must be applied to a surface in order to be used. Many surfaces can be used with compounds, leather strops being one of the most common. The compound is applied to the surface and then the edge is passed over it. 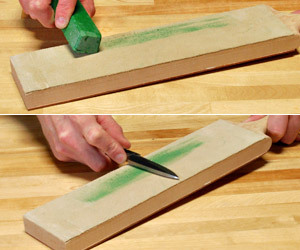 Note that honing compound is the final abrasive used in the sharpening process. The abrasive particles are extremely small and will polish an existing edge to a mirror finish, but are not aggressive enough to bring a dull edge back to sharp. The edge being sharpened must have been taken through the finest sharpening stones before the compound is used for it to be effective. 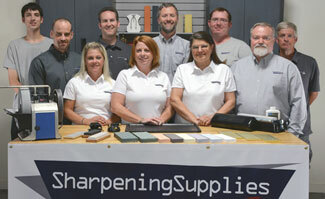 See our article Understanding Strops for more information about strops and how to use them. What are my options in honing compounds? We have honing compounds available in wax bars, powders, pastes and sprays. Because of their economy and practicality, wax bars are a go-to format for many sharpeners. Simply rub it onto almost any surface, and you’re ready to go. We carry Green Honing Compound, which is the most popular of all our honing compounds. A chromium oxide and aluminum oxide compound in a wax bar, it is fast and effective for polishing to a mirror finish. A 6oz bar goes a long way, providing years of use. I can personally attest that my own has lasted many years and still has plenty left. Abrasive powders are loose grit that can be sprinkled on a strop or similar surface to polish an edge. Because there is no binder to hold the grit to the surface, it may need to be reapplied frequently. The Abrasive Powder we carry is a .5 micron aluminum oxide. Pastes are softer, spreadable honing compounds. Our selection of pastes features diamond abrasives like DMT’s Dia-Paste and Norton’s Diamond Paste. They are available in 6, 3 and 1 micron grits, which correspond to water stones of about 2500, 5000 and 16000. Consider combining them with DiaSpray to create a complete polishing kit. Sprays are neat and easy to use for achieving razor sharp edges. We carry DiaSpray from DMT, which is graded to a uniform .5 microns. Equivalent to a 30000 grit stone, it’s an excellent follow up to our selection of diamond pastes, with only a small amount required for mirror finish results. One or two squirts onto a strop is usually all that’s required to do the job.